Been thinking lately about rice, and wanted to share about my experience with white vs. brown rice. When we went Paleo in December of 2012, I didn't cut rice out of my diet entirely. We never make it at home, but I have no issue eating it with sushi or at Thai restaurants. I used to always order brown rice when possible when dining out, because I thought that brown rice, with the fiber and husk, was a "healthy whole grain" and was slightly healthier than white. 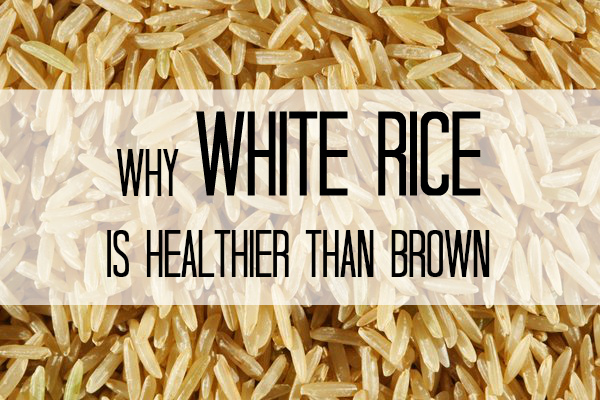 But I've learned a lot since then about white and brown rice, and there are several factors that have contributed to me choosing white rice instead, for health reasons! White rice is healthier than brown? What the heck, you might ask. We've been taught in recent years that whole grains are better than white. First, why are brown (whole) grains harmful? We don't eat grains and legumes as part of our "Paleo"-based diet. (Mark's Daily Apple has a great post on why grains in general are often harmful; so does The Paleo Mom.) In summary, there are a few reasons for this. Grains contain proteins called lectins, which are the plant's defense mechanism and so can cause autoimmune reactions in the gut, as well as cause leptin resistance (leading to fat storage). Many people on standard American diets, with grains at nearly every meal, can develop leaky gut for this reason. (Side note: just read a great summary post about healing leaky gut. Intro to leaky gut here.) Our guts do not have the enzymes needed to break down these proteins and acids. Phytates also block the absorption of essential minerals because they bind to the magnesium, calcium, zinc, and iron we are digesting and take it out of our bodies. Many people are deficient in these micronutrients, if they're not eating enough vegetables and nutrient-dense animal products, so removing them can have a huge range of negative effects depending on what you're already low on. But some grains are worse offenders than others! Rice is often considered the least offending grain, and most people can digest it fairly easily. So, a lot of people on Paleo and real foods diets eat it. Dental health and nutrition expert Ramiel Nagel wrote this intense piece about phytic acid; as he explains, the phytates are stored in the bran and germ of grains, so white rice and white bread are lower in phytates than brown. What about the benefits of whole grains for fiber and blood sugar regulation? Indeed, it's taken quite the mental shift for us to think of a white grain as being healthier than a whole grain. But I feel good when I eat it, I know I'm absorbing more micronutrients, and I've still lost 40 pounds in the past year eating a higher-fat, processed food-free, grain-free (except the rice) diet. It's been a good shift! As I wrote this post, I found this article on the same topic--check it out if you want more reasons! Did you also know brown rice has higher levels of arsenic then white? Another reason to eat white rice! Totally seconding cooking rice in broth instead of just water- so much more flavor, not just more nutrients!